What are the specs for pivot-mount hinges? Below are the most specifications for side-mount hinges that people ask about. When do I select my glass shower hardware? The first decision you'll need to make is what glass thickness you'll build your frameless shower with. This will determine the hardware, which is designed to fit a specific glass thickness. What types of pivot hinges can be used to troubleshoot my shower configuration? There's a different pivot hinge for each of the major door configurations. A standard pivot hinge is designed to fix to a ceiling. Others include: a glass-to-glass pivot that attaches to an overhead transom, another type of hinge fastens to a header. There's also a wall pivot hinge for a door that does not go all the way to the ceiling. Will a pivot hinge work on my neo angle shower door? Yes, using a glass-to-glass pivot hinge. If I want a unique, angled shower configuration, can I still use a pivot hinge? Need answer. What material is your pivot hinge made from? Our hinges are made from solid brass with high-quality, true finish; no other company can top our hardware for strength and integrity. Be wary of other hardware in the off-the-shelf kits. It may be metal-plated, and not hold its finish or longevity. How much weight can a pivot hinge hold? The strongest, thickest pivot hinge can hold 145 lbs of half-inch thick glass. The maximum door width is 36 inches. Because the weight of a pivot hinge door is carried at the bottom, where the floor offers strong structural support, two pivot hinges can carry more weight than three side hinges. Is there a warranty on the life of my pivot hinge? Yes. All our hardware comes with a three-year warranty. Are there different designs to select for a pivot hinge? No. 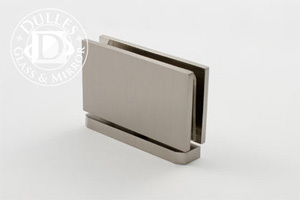 You see less of a pivot hinge than side hinges, so these are designed for function and form. You can select a finish to match the rest of your bathroom fixtures. What finishes are available for pivot hinges? 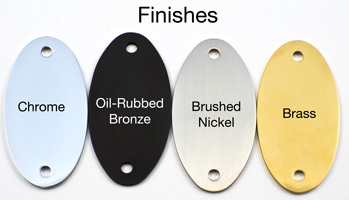 Our standard sizes come in Brushed Nickle, Chrome, Gold and Oil-Rubbed Bronze. Why is choosing a hinge type for my frameless shower door so important? What's the difference between a pivot hinge and a side-mount hinge? Is a pivot hinge shower door less expensive than a side-mount hinge shower door? 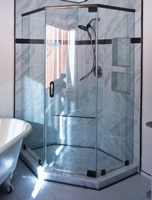 Why is choosing frameless shower hardware so important?